The Hocker brothers Joe and Tom from Oakland California were both into Custom Car. 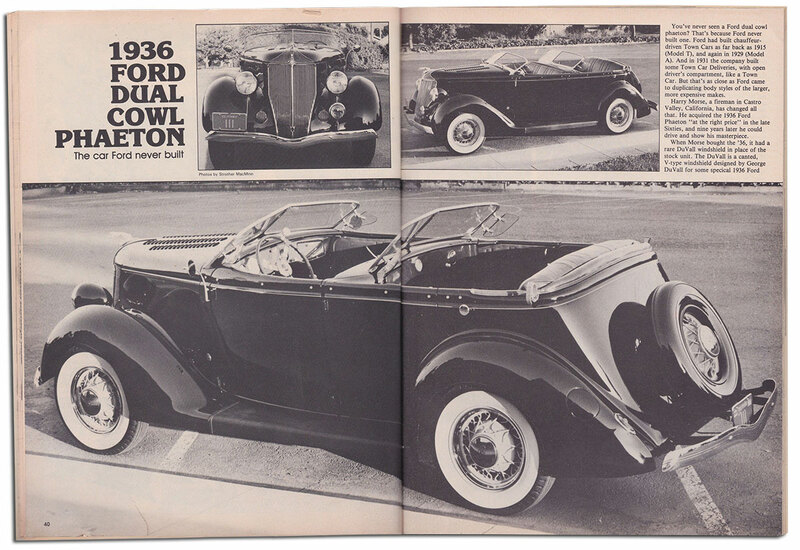 Tom had the famous Barris Restyled 1940 Ford, and Joe a DuVall windshield 1936 Ford Phaeton. 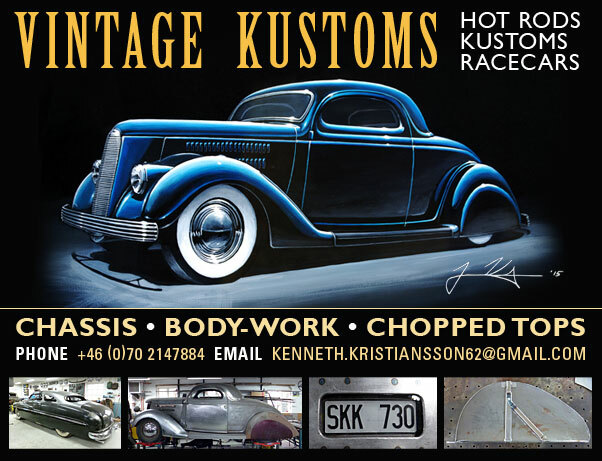 Of the two Hocker Brothers Joe (Joseph) and Tom we are most familiar with Tom’s 1940 Ford restyled by the famous Barris Kustom Shop around 1953, and later updated around 1957. While doing research for the restoration of the Tom Hocker 1940 Ford, John Canepa came in contact with the Hocker family. Sadly Tom and Joe are no longer with us, but John was able to get some great information and pictures from Joe’s Hocker‘s widow and son Joe Jr. Besides some great snapshots they also shared some valuable information that helps John with the restoration on the Tom Hocker ’40 Ford. 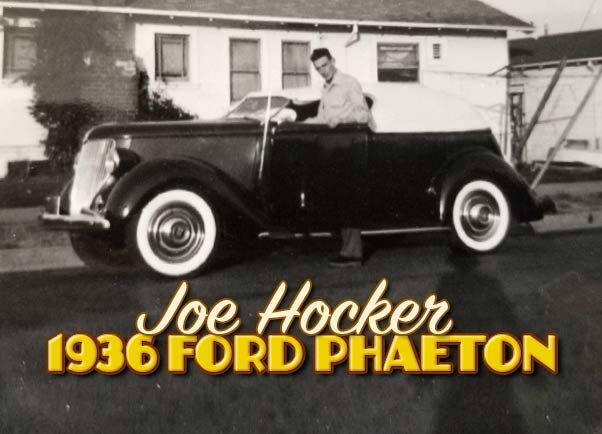 During the conversation with the Hockers, John also learned about brother Joe’s earlier custom, his 1936 Ford Phaeton. 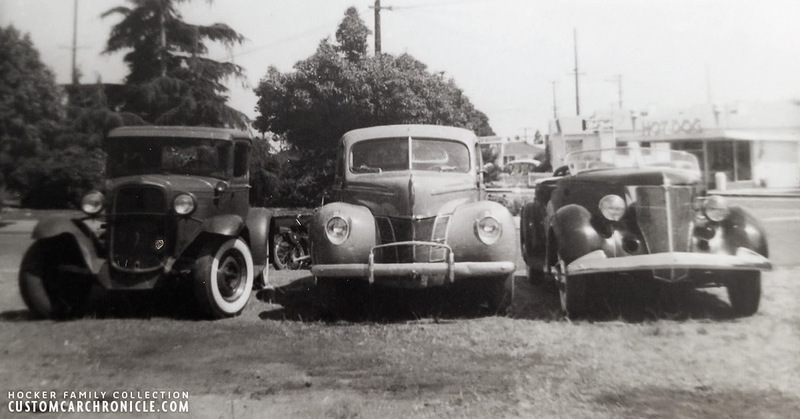 Joe Jr. shared a few of the family snapshots of his father’s ’36 Ford and when John shared those with me I recognized the car immediately as the Joseph Hocker Ford that was entered at the 1951 National Roadster Show in Oakland Ca. 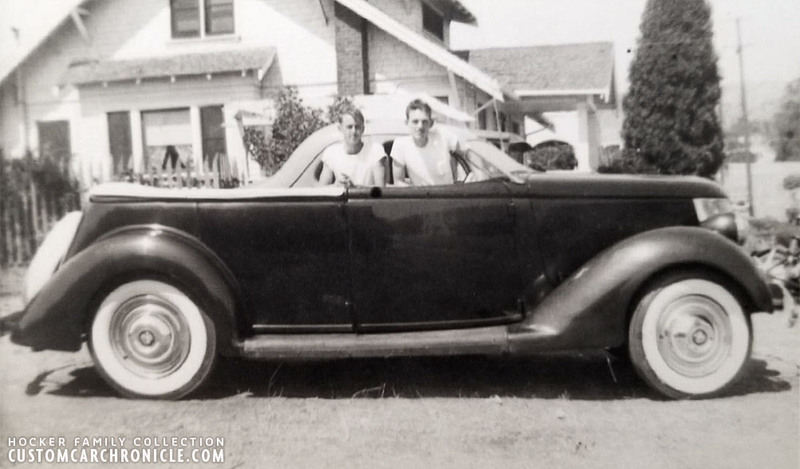 For some strange reason I never made the link between Joseph Hocker with his ’36 Ford and Tom Hocker with his 1940 Ford Coupe, and never realized these were two brothers who were both into Custom Cars. Tom Hocker with his chopped ‘40 Ford fresh from Barris Kustoms in ‘52. 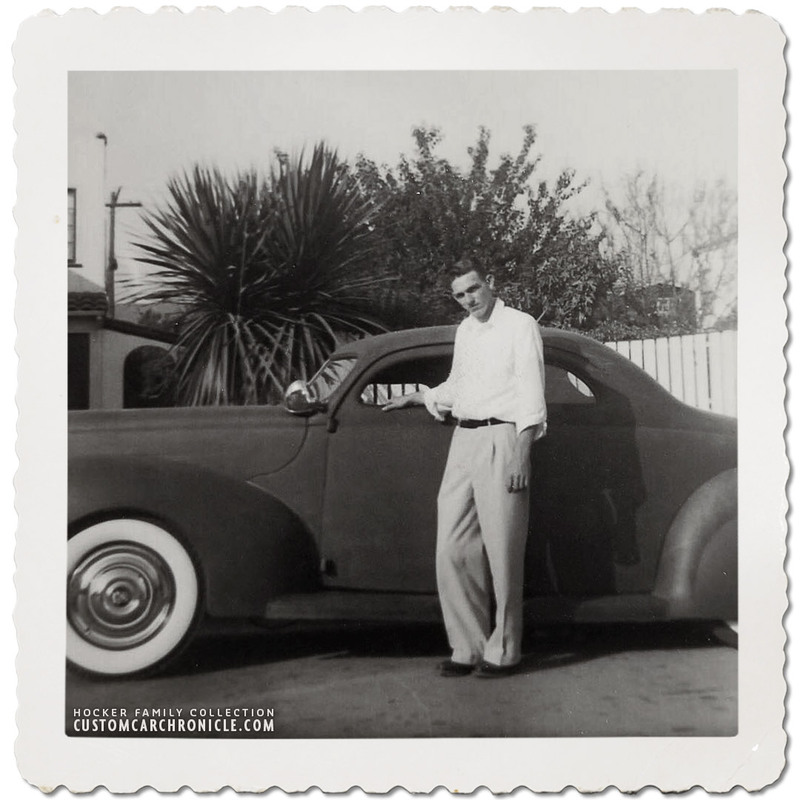 When John Canepa was asking the Hocker family for more info and photos of the Tom Hocker ’40 Ford they found this one, and many more, and they also came across the ’36 Ford images of Tom’s brother Joe. The car we concentrate on in this article. Tom’s 1940 Ford was a very well known Barris Custom, first painted Fuchsia Orchid, and later in metallic medium blue with scallops and later dual headlights. The was featured in many magazines, and in color on the cover. 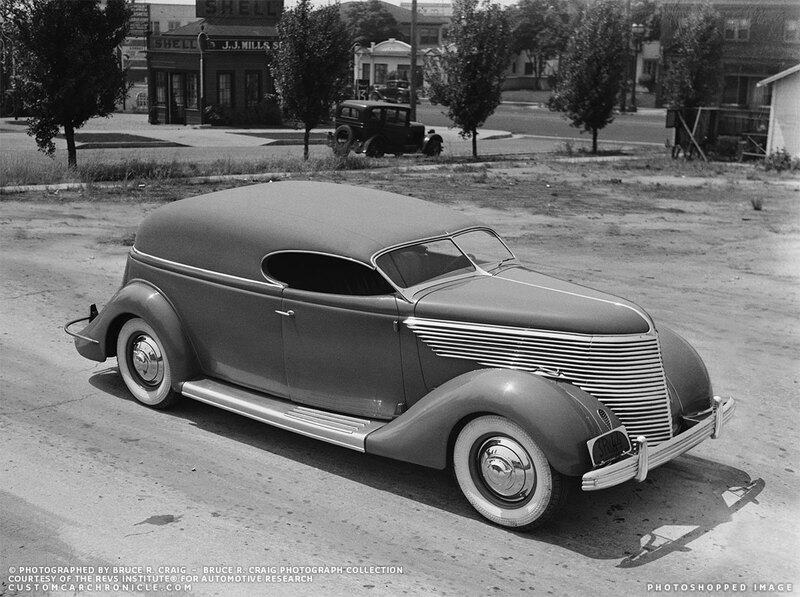 Joseph’s ’36 Ford was on the road a few years earlier, basically just before the major car magazines were published. 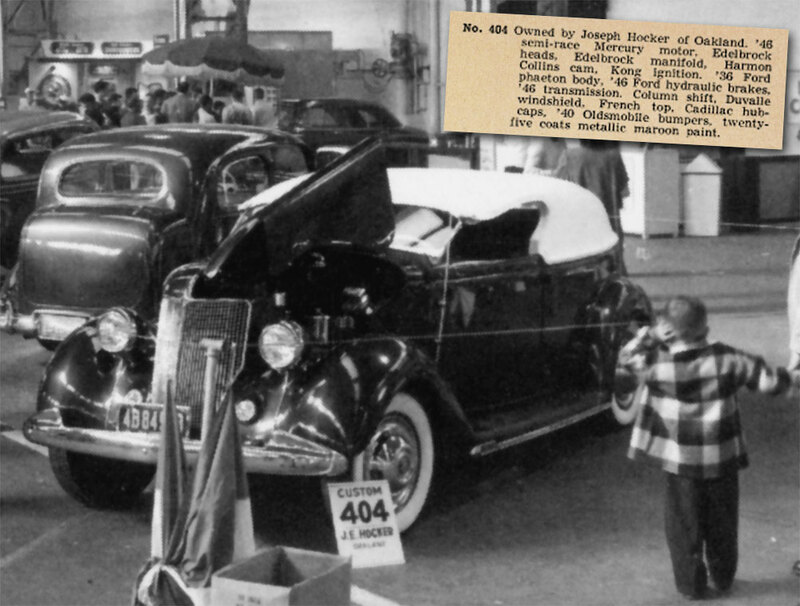 So far we only had heard about his Ford from the 1951 National Roadster Show. And seen a few photos of the car from this show. We also had some info how the car had survived and is still around today as a semi restored car with dual cowl and dual V-Windshield. When John Canepa shared the Hocker family photos and the info he had gathered it all fell in place. 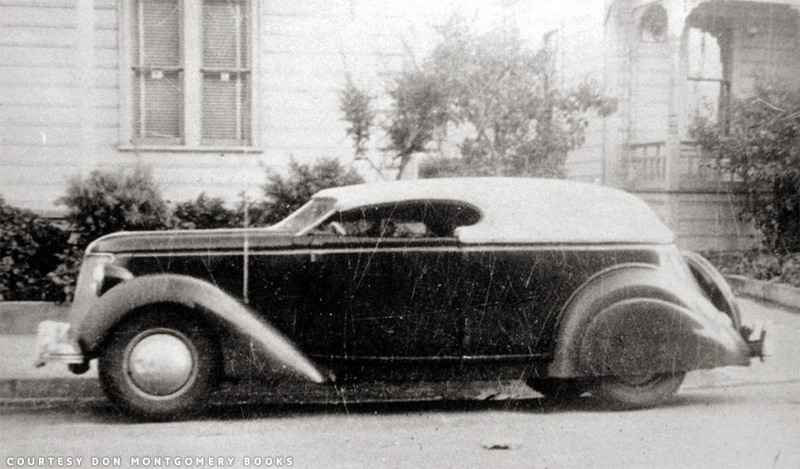 We are still trying to find out more about the early days of the Hocker Brothers and their Custom Cars. Finding out more about Joe’s ’36 Ford, when it was restyled, and who did the work on the car. Hopefully we will be able to get more details at a later date, initiated by this article. And if we do, we will update the info in the article. George DuVall designed and created the now famous DuVall V-Windshield for the SoCalif. Plating 1935 Ford in 1936. Even though the windshield was original designed for the ’35-’36 Fords the windshield really became popular after it was modified to fit the narrower 1932 Ford body. Over the decades the DuVall windshield has been used more on Hot Rods than on Custom Cars for which it was originally intended for. But there are a few samples of early Custom Cars that used the streamlined DuVall V-windshield. 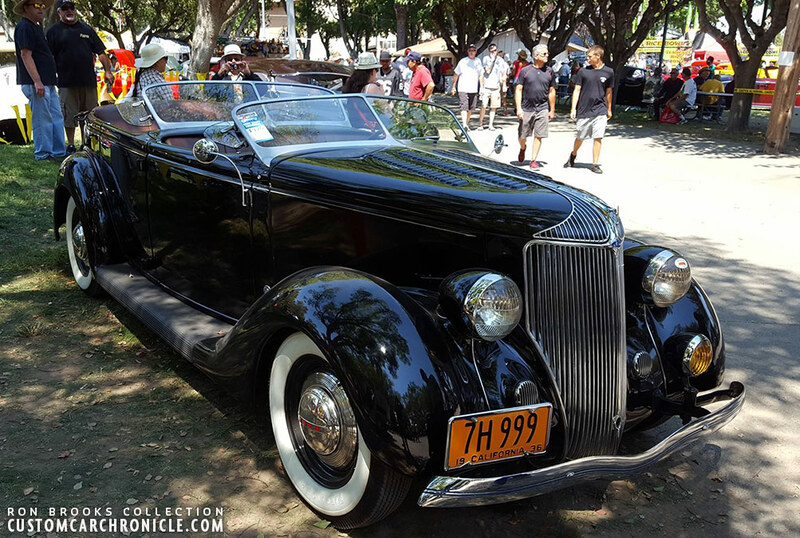 Joe Hocker’s 36 Ford Phaeton is one of them. Joe Hocker with his 1936 Ford Pheaton with DuVall windshield and matching padded top. Julian Doty is DuVall’s nephew and was selling the windshields in the 40’s & 50’s. Most likely Joe bought the DuVall windshield from him. We are not sure if Joe ever saw the SoCali Plating ’35 Ford in person, or perhaps in one of the early publications. So we do not know if this inspired him to get the DuVall windshield, and shape of the Padded top in a similar way, but since the similarities are striking we do think the SoCal Plating Shop truck was an influence on Tom’s Ford. Julian Doty, who was George DuVall’s nephew, was marketing the DuVall Windshields in the 1940’s and 1950’s. So most likely Joe bought one of them from Julian, or perhaps thru a dealer. What we do know about the Hocker brothers is that they were very creative, and skilled to do a lot of work on their cars them selves. But when it came to work they felt not comfortable with, like the majority of the body work, paint and interior, they went to the best on the market. 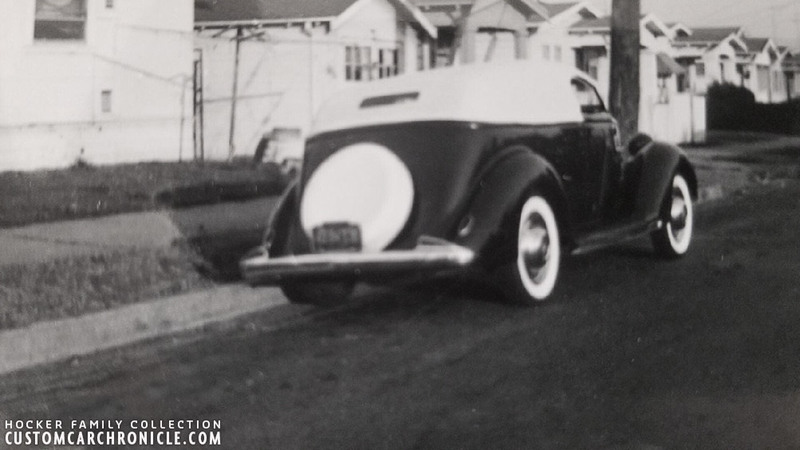 Joe’s 36 Ford was never featured in any magazine or book, at least not in its original form. Which could have helped us with crucial information. 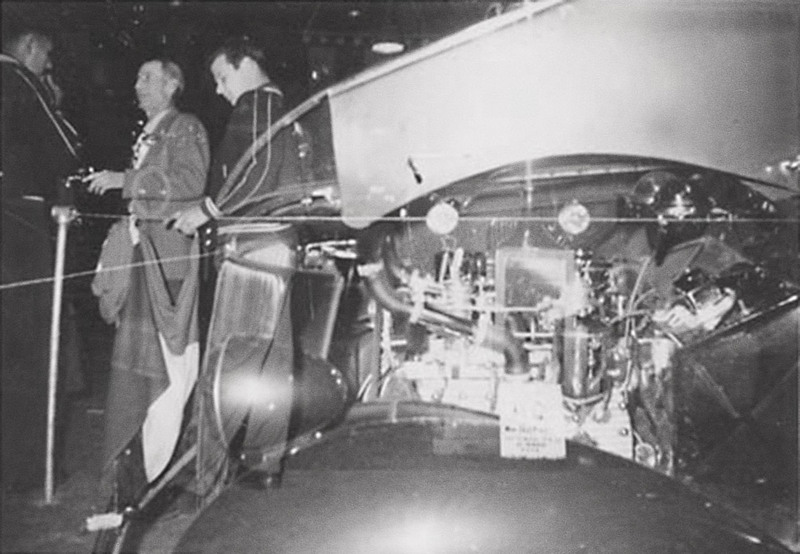 At this moment the Hocker family could not remember if anybody else but Joe and Tom worked on the Phaeton body. Making the windshield fit the cowl, and other body changes, perhaps the Hocker brother did the work at their home shop, perhaps it was outsourced. The uniquely shaped padded top, with French curve, might have been done by the C.A. Hall Auto Tops in Oakland Ca. Joe and Gwen with the ‘36 Ford. 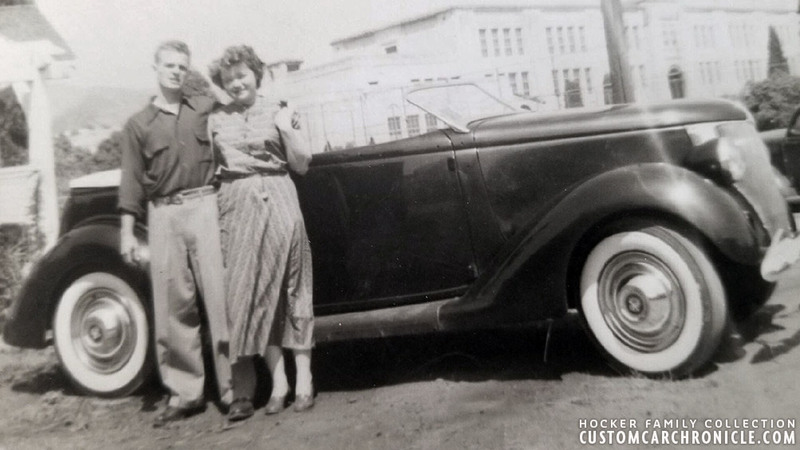 Gwen Hocker, Joe’s wife, remembered a few things about Joe’s ’36 Ford ans shared those memories with John Canepa. Joe got his driver’s license when he was just 13 years old. Joe and his brother Tom worked on their cars on a dirt floor behind their small house. One day, when taking a trip in the ‘36 with the padded top left at home, they were caught in a rainstorm, and lightning struck the chrome dash while they were driving! In the early 1950’s Joe made a living from being was a handyman at an apartment complexes nearby where they lived. Joe and Tom behind the ‘36 Ford. This side view shows the very steep angle of the DuVall windshield really well. It gave instant speed to the Ford. Joe installed a 1946 Semi-race Mercury engine with Edelbrock heads and manifold, Harmon Collins cam, Kong Ignition and ’46 Mercury transmission in the car. He modified the suspension to get the car a bit lower, but not as low as most other Customs from the same era. He updated the suspension with ’46 Ford hydraulic brakes. The stock bumpers were replaced with 1940 Oldsmobile bumpers front and rear. The stock hood sides were replaced with aftermarket smooth units, the hood ornament was replaced with a bull nose aftermarket piece for a smoother look. And the grille side pieces were chrome plated. Joe shaved the door handles and with all the body work done, the car was painted with 25 coats of metallic maroon paint. Joe added 1939 Ford teardrop taillights to the smoothed rear fenders. In the 1951 Oakland Show Brochure it is listed that the car had Cadillac Hubcaps, but by the looks if it I think they are aftermarket look alike that are a bit less deep, allowing the stock Ford wheels to be used. The hubcaps look really great with the car with the wide white wall tires and no skirts in the back giving the car an European vibe. The only rear view we have of the car is this out of focus snapshot. It shows the canvas covered spare tire, and the use of ’39 Ford teardrop taillights on smoothed rear fenders. Joe’s ’36 Ford on the right along with a few Friends cars. At this moment we do not know the full story on Joe’s Ford, what happened to the car from the time the snapshots in this article and those at the 1951 Oakland Roadster Show were taken, until the late 1960’s. Hopefully we will be able to update this article later with more info about this time. We do know, thanks to Ron Brooks, that in the late 1960’s, or perhaps early 1970’s Harry Morse owned the ’36 Ford, and he took it to Don Bridgeman (Don’s Body Shop) to convert his car to a dual-cowl body. Wonderful front 3/4 view of Joe’s Ford with some of his friends cars next to it. Until recently the only photos we had seen of Joe’s ’36 Ford were taken at the 1951 National Roadster Show, the second annual Roadster show in Oakland California. In the 1951 Show booklet the owner of the car was mentioned to be Joseph Hocker. The Roadster Show was a local show for Joe, but it meant that his car would become world wide known. Perhaps not right then, when it was shown, but it sure has been in the last few decades. 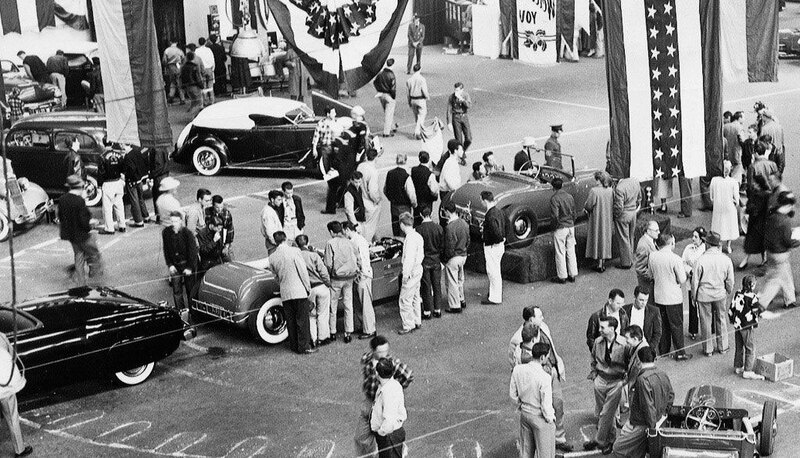 Overview photo of the 1951 Oakland Roadster Show shows Joe’s Ford with one hood side open to show of the mercury engine and the padded top in place. Close up of the photo above. This picture shows a hint of what is going on in the engine bay. It looks like Joe used plenty of chrome and polished parts to make the Mercury engine look at its best. 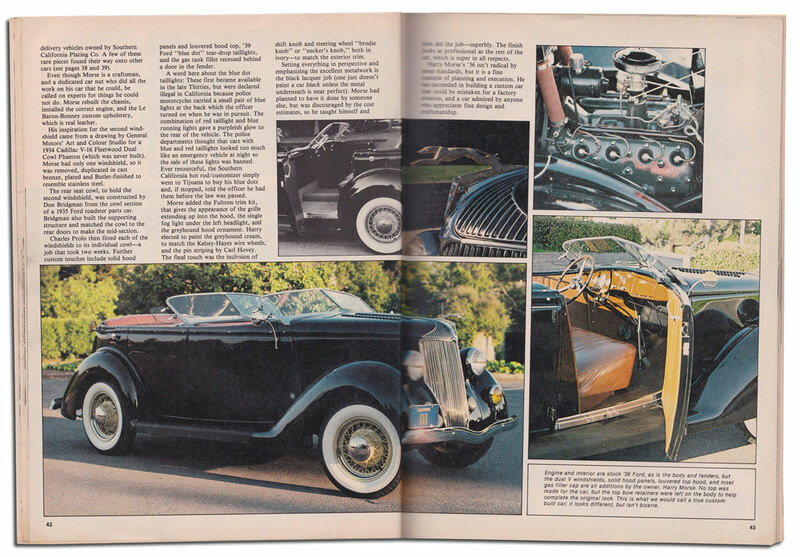 The inset is the write up on Joe’s Ford in the 1951 National Roadster Show booklet. A double exposed snapshot showing the engine of Joe’s Ford. 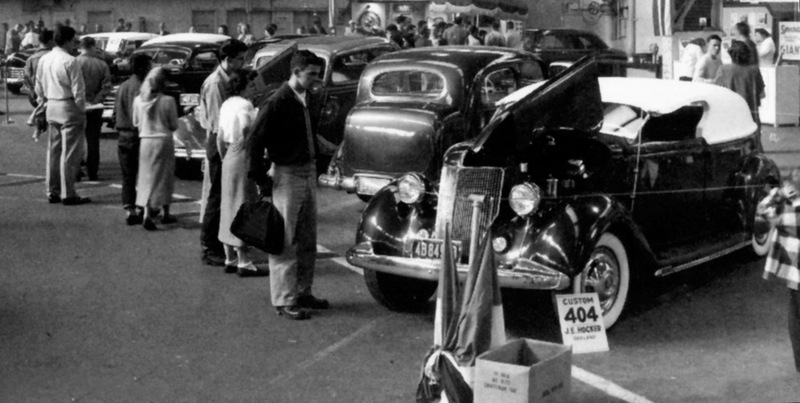 Custom Cars were well present at the 1951 Show. Side view photo taken at the show by Rudy Perez. It gives us a good look at the padded top. 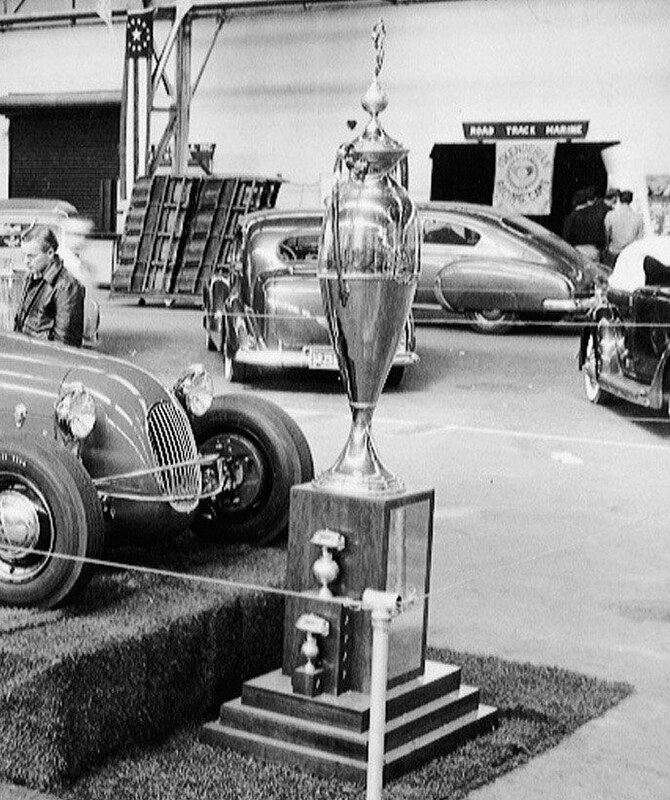 Joe’s Ford just visible on the right of this picture of the National Roadster Show award. Morse replaced the Mercury engine with a bone stock unit and had the interior redone in leather. The DuVall windshield was not stock, but it inspired Harry to do something special and create a dual cowl ‘36 Ford based on a General Motors design for a ’34 Cadillac he had always been impressed with. The second windshield was created using the original brass unit as a base, and modified it to fit the hand made second cowl, created by Don Bridgman. Don used a cowl of a ‘35 Ford Roadster parts car to create the second cowl. The brass cast unit was polished and plated. 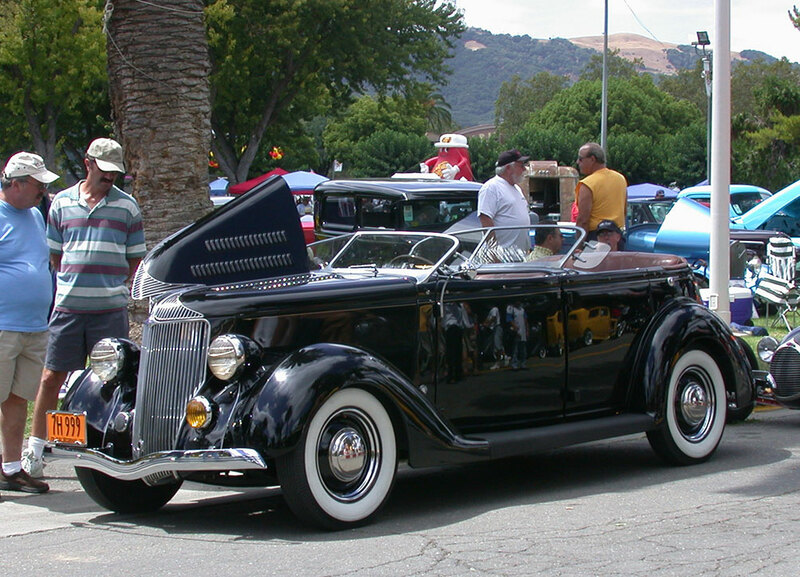 Morse kept the smooth hood sides, and added body color grille sides, stock hood ornament as well as grille extension Fultron trim pieces on the front of the hood. 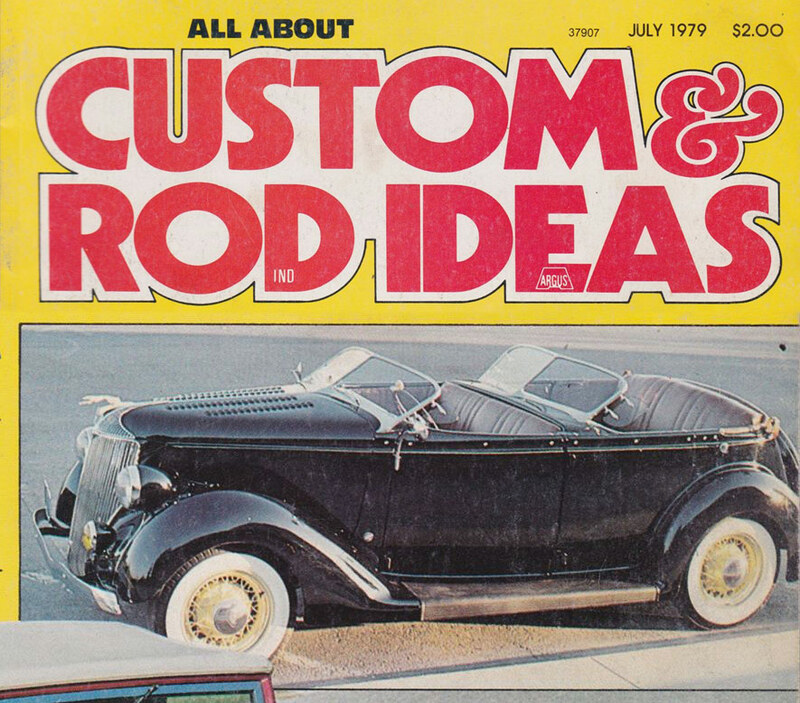 July 1979 issue of Custom & Rod Ideas had a very nice feature on the ’36 Ford after it was own by Harry Morse, of Castro Valley, California. Custom &Rod Ideas opening spread. 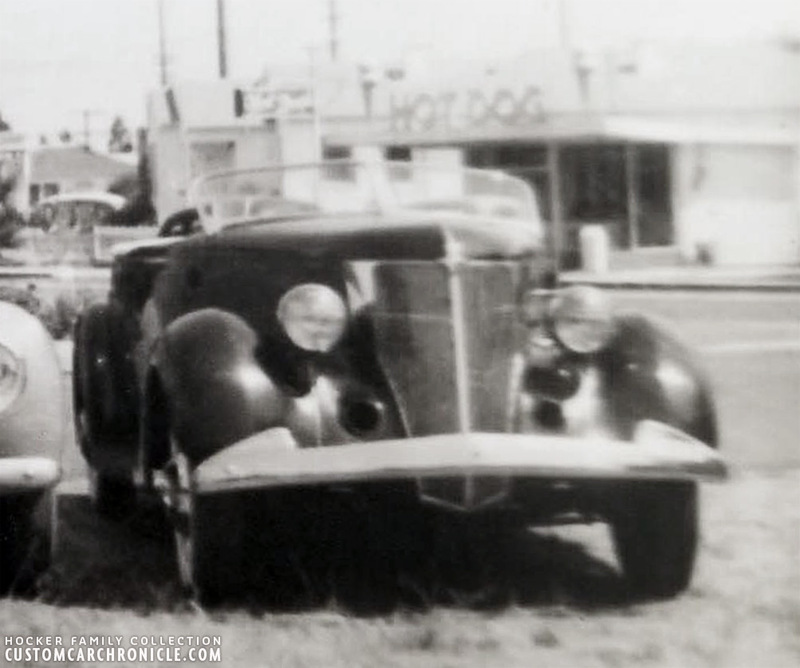 This bottom photo shows that the car has an fender mounted gas filler as well as ’39 Ford taillights. Both are most likely left from the original Joe Hocker version. Second spread showed some color as well, including the beautiful leather interior. In the early 1990’s Harry Morse sells the Ford to Mike Aahl, also of of Castro Valley. Mike has made a few small changes to the car over the years, including adding new wheels and tires and adjusting the stance a little to get it a little lower, perhaps more to how Joe Hocker had it in the early 1950’s. Mike still enjoys the car and it pops up at local car shows from time to time. Taken a few years ago, now owned by Mike Aahl of Castro Valley, who has owned it for 25 plus years now. Mike has made a few changes to the car, including a stance adjustment, new white wall tires and steel wheels with 48 Ford hubcaps and beauty rings. Ron Brooks took this picture at a GoodGuys show a couple years ago. The George DuVall designed SoCalif Plating Shop hauler 1935 Ford was created in 1936. 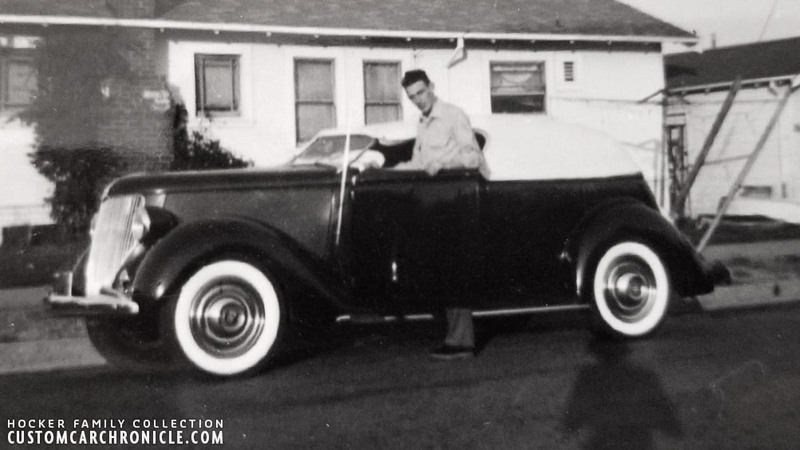 It might have been the inspiration for Joe to created his ’36 Ford. A ’36 Ford similarly restyled as the Joe Hocker Ford is the Tommy The Greek ’36 Ford. Often these two cars are mixed up. Joe’s Ford has stock fenders with running boards, four doors and had Olds bumpers, while Tommy’s Ford has reshaped fenders, removed running boards, skirts and Pontiac bumpers. Great story with details I was unaware of. Yes, great story once again! Thanks Rik, and thanks to the Hocker family and John Canepa for the background on this very nice custom. Great Job Rik , I remember when we first started wondering about this car. Its great to now have the full story on this . The new photos are fantastic.